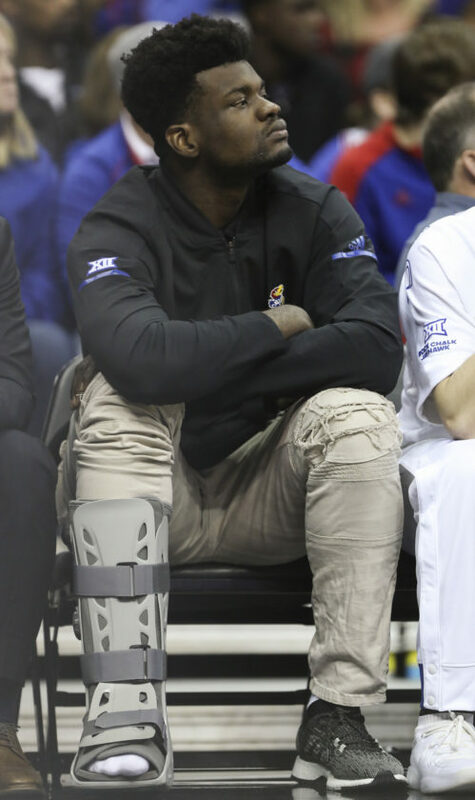 Injured Kansas junior Udoka Azubuike watched his top-ranked teammates knock off No. 17 Villanova, 74-71 at Allen Fieldhouse on Saturday morning, the second consecutive outing that a sprained right ankle kept Azubuike on the bench. But KU coach Bill Self said after the victory that the 7-foot center was on track for a return. 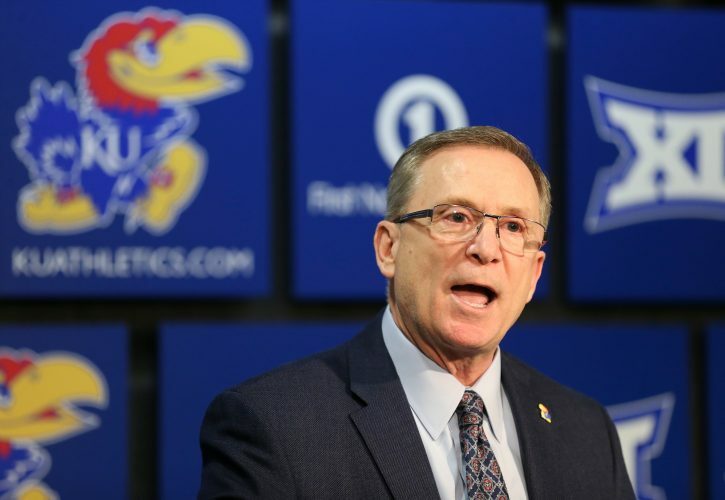 With Azubuike sidelined, sophomore guard Marcus Garrett started for the second game in a row and essentially played the 4-spot while Dedric Lawson handled Azubuike’s role. Self praised Garrett for his “terrific” defense on Villanova big man Eric Paschall (17 points on 4-of-10 shooting) and praised the entire team for having the right mentality despite being down one rather large man. Fellow KU big men Mitch Lightfoot (14) and David McCormack (1) combined for 15 minutes in Azubuike’s absence, but at least one Jayhawk does not think this team will have to piece things together much longer. Big games often attract big names and Saturday certainly was no exception. In addition to the usual faces of former KU players like Sherron Collins, Tyrel Reed and Wayne Simien filling the seats behind the home bench, a handful of other former Jayhawks also were in attendance, with Nick Collison, Landen Lucas, Clay Young and Justin Wesley all taking in the action. And then, seated near them, were Class of 2019 signees Christian Braun and Issac McBride. KU grad and current PGA pro Gary Woodland also was in attendance. But by far the biggest reaction for the celebrities who made it to Allen Fieldhouse on Saturday came from a pair of Kansas City pro teams, with Kansas City Royals legend George Brett and current Kansas City Chiefs Patrick Mahomes and Travis Kelce scoring a seat for the game, as well. Brett and Mahomes were introduced back to back on the video board during a timeout and the Allen Fieldhouse fans roared for Mahomes, who also attended a KU game last season. Seven new KU football assistant coaches — Kwahn Drake, DJ Elliott, Mike Ekeler, Chevis Jackson, Emmett Jones, Chip Lindsey and Luke Meadows — also heard their names called during Saturday’s game. 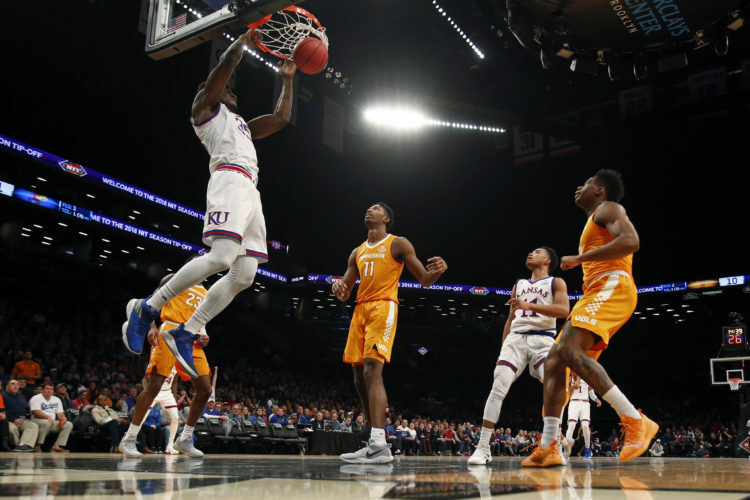 As one of two healthy players who logged meaningful minutes in last year’s Final Four loss to Villanova, senior guard Lagerald Vick sure was glad to get this one behind him. The reason? It wasn’t just because he felt good about coming out on the right end of things this time around, but rather because he now knows he’ll never have to watch that Final Four game again. Saturday marked the first ever Teddy Bear Toss to support Toys for Tots and, at halftime, hundreds of fans filled James Naismith Court with stuffed animals that will be donated to children throughout Douglas County. 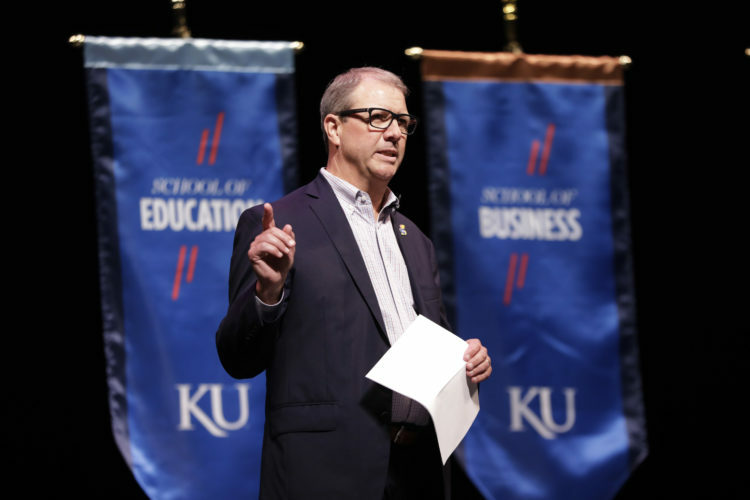 In all, KU fans tossed 1,761 teddy bears onto the Allen Fieldhouse floor, a number that paled in comparison to the world record of 34,798 donated by fans of the AHL’s Hershey Bears, but more than enough to keep the KU spirit squad busy collecting the bears in trash bags throughout halftime. 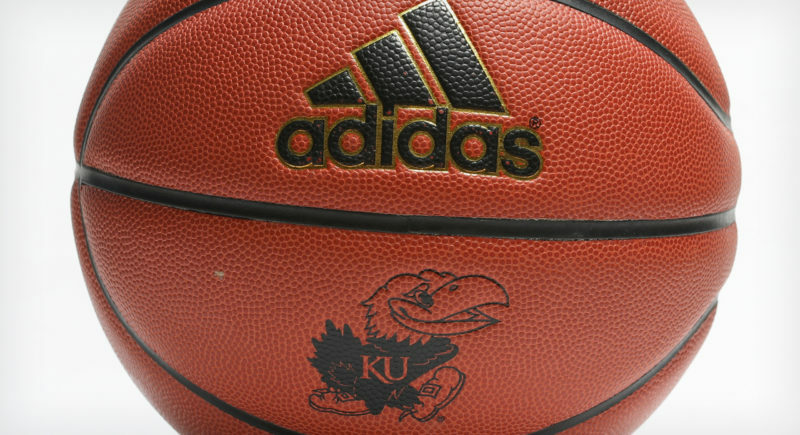 Saturday's win moved the Jayhawks to 9-0 for the first time since the 2010-11 season... KU now has won 39 consecutive games inside Allen Fieldhouse while carrying the No. 1 ranking in the Associated Press Top 25 and moves to 47-3 all-time as the AP's No. 1-ranked team... Kansas is 3-0 this season against Top 25 teams... The Jayhawks became the fourth team to outrebound the Wildcats this season and Villanova came out on the losing end in all four games... Kansas hit 11 of its 12 free-throw attempts in the game's final 1:10... Vick and Lawson's 57 combined points were the most by a KU duo since Elijah Johnson (39) and Travis Releford (19) combined for 58 in an overtime win at Iowa State... Villanova received zero points from its bench, marking the first time that KU opponent's bench was held scoreless since Oklahoma State in 2012.